Can I first start out by saying... Boys sure are different!! When I watch Grant, I am amazed at how he learns SO much, SO fast!! A few weeks ago we were out back watering the garden, and I looked behind me to see that Grant had climbed up our fence... Needless to say it freaked me out! He is so much a little boy, and I'm glad I have a grow-up little boy who can explain it to me (& then attempts to make me feel better by stating what he use to do as a "little" boy, it doesn't help!!!) Just this past week or so, I've noticed something that stunned me... 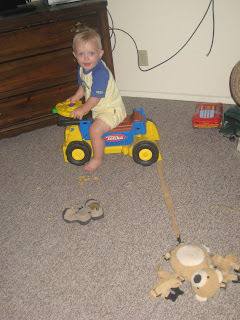 He got out his little monkey backpack, and took the hook to put on his truck to haul around. He is going to be SO much like his daddy!!! Mark has the same love for A. 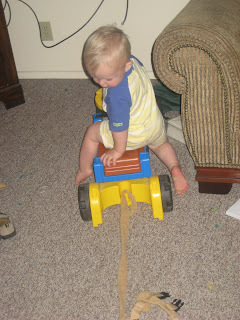 Trucks B. Trailers & C. Pulling the trailers with his truck. It is a lot of fun to have such an awesome little boy!!! That is cute! It's amazing how boys just know that they're boys. It's like my little 1 year old nephew, my sister gave him a car to play with (never before having had him play with a car) and he proceeded to push the car around making car "noises". Boys are cute! Grant is such a cute little boy!! I wish you were here so he could play with my boys! It's fun to watch them grow, especially with all the new things they do and you wonder..."How did they learn that?" What a cutie. Just you wait. . . there is way more to come!! My biggest wonder about boys is how they know how (and love) to wrestle. Girls don't do that. They definitely come wired to do certain things! Enjoy every minute of your cute little guy! Wow! He is growing up way too fast. I wish he would let me get close to him so that I could give him a big hug! He is just so dang cute. Maybe someday and then again...maybe not. I still love him though!